Understand why and how you need to uniquely identify your products with barcodes and Global Trade Item Numbers. This course is best suited for you if you are new to GS1 Standards or looking to refresh your knowledge of the fundamentals. 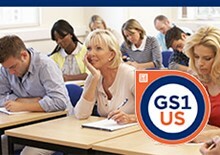 This course is offered in June at GS1 US University at GS1 Connect 2019. To learn more and to register visit us at: https://gs1connect.gs1us.org/agenda1.